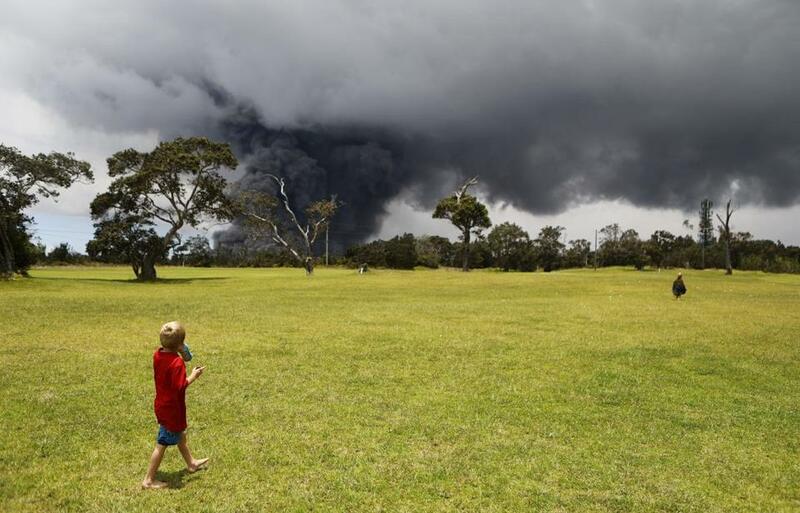 Two men played golf as an ash plume rose in the distance from the Kilauea volcano on Hawaii&apos;s Big Island on Tuesday. It was the photo seen ’round the world — the world of golfers, at least. A picture snapped in Hawaii on Tuesday showed a pair of golfers carrying on with their round at Volcano Golf and Country Club — yes, that is really the name — as an ash plume from a nearby volcano appeared to rise around them. While everyone else on the course seemed to be awestruck by the plume, the golfers seemed unimpressed and faced away from the cloud as they continued on with their game. So what exactly led up to this moment? 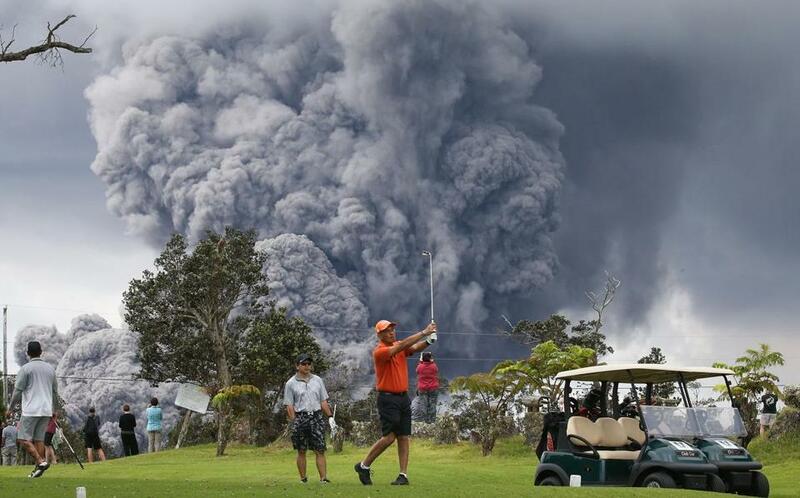 Mario Tama, a Los Angeles-based Getty Images staff photographer who captured the moment, told the Globe that he was perusing the golf course on Hawaii’s Big Island after a peer hinted that the course was a great place to snap photos of volcanic activity because of the lack of trees in the way. He said he saw at least one group of golfers leave the course in a cart, and then turned his focus onto shooting pictures of locals who were watching the ash plume. 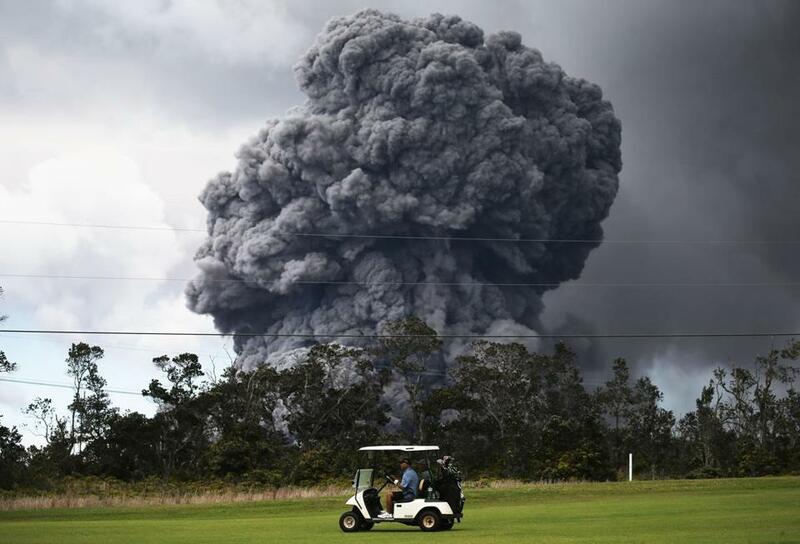 A man drove a cart at a golf course as an ash plume rose in the distance from the Kilauea volcano on Hawaii's Big Island Tuesday. “I thought no one else would be golfing,” Tama said. That’s when someone called out to him. Despite the attention that Tama’s photo has gained, he noted that the locals are fairly used to the seismic activity nearby. Tama also pointed out that there appeared to be no immediate danger at the time the photograph was taken. 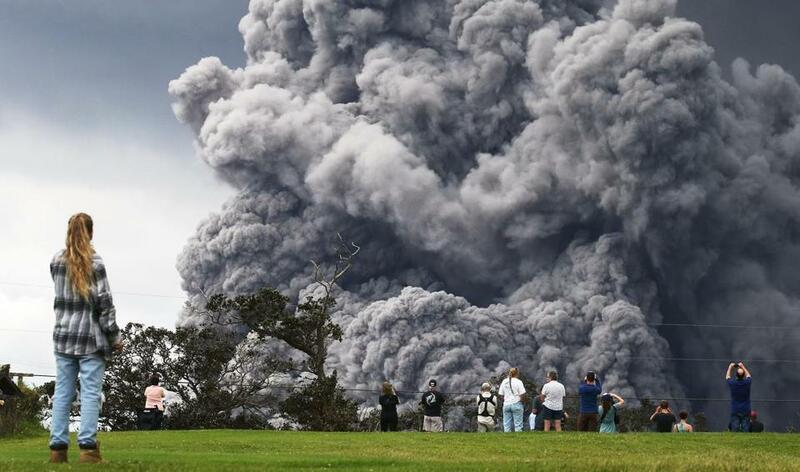 Tama, a news photographer who said he travels a lot for work, arrived in Hawaii in early May to capture the volcanic activity for Getty. He said this was his first time ever visiting Hawaii. On Tuesday, ash plumes from Hawaii’s Kilauea volcano had spouted as high as 12,000 feet, scientists said. Those plumes were separate from the lava eruptions happening about 25 miles away from the summit, where about 20 lava fissures have destroyed more than two dozen homes and forced the evacuation of about 2,000 residents. Ash emissions have since decreased, prompting the cancellation Wednesday of an ash fall advisory. 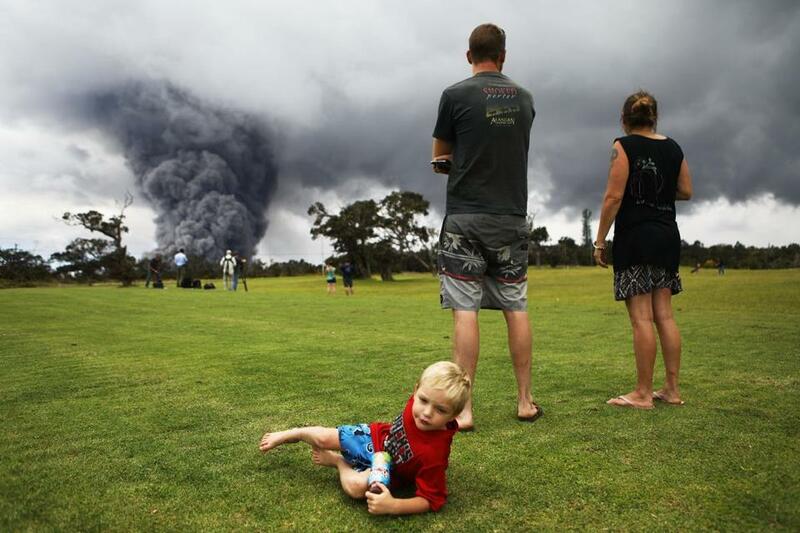 People watched the ash plume rise. 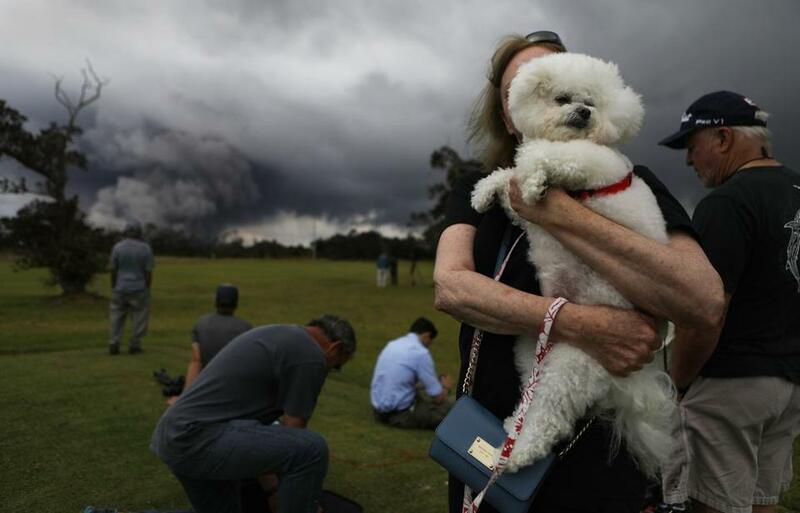 A woman hold her dog, Tzippy, at the golf course. A family gathered on the course to watch the activity. Boys played on the golf course as an ash plume rose in the distance.